La Fiesta is our go to neighborhood mexican place that we have been to many times over the years. It is on the corner of Richmond and Wilson Mills right next to the Richmond Mall. The food and service is always good. We stopped for dinner on Monday after going to the bridal shop for Sophia and Grace to pick up their bridesmaids dresses for George and Carrie’s July wedding. Don’t they look nice? Back to La Fiesta…. I had a margarita on the rocks, just ok, nothing special. Their chips and salsa are very good with hot, crunchy chips and homemade, spicier than usual salsa. We all ordered standard mexican restaurant fare. The enchildas with green sauce were very good as well as the tamales. Courtney had vegetarian tamales and I had ones with some sort of shredded meat in them. We all ordered too much, but mexican always makes good leftovers. I’ve heard that La Fiesta is tasty but have never tried it. 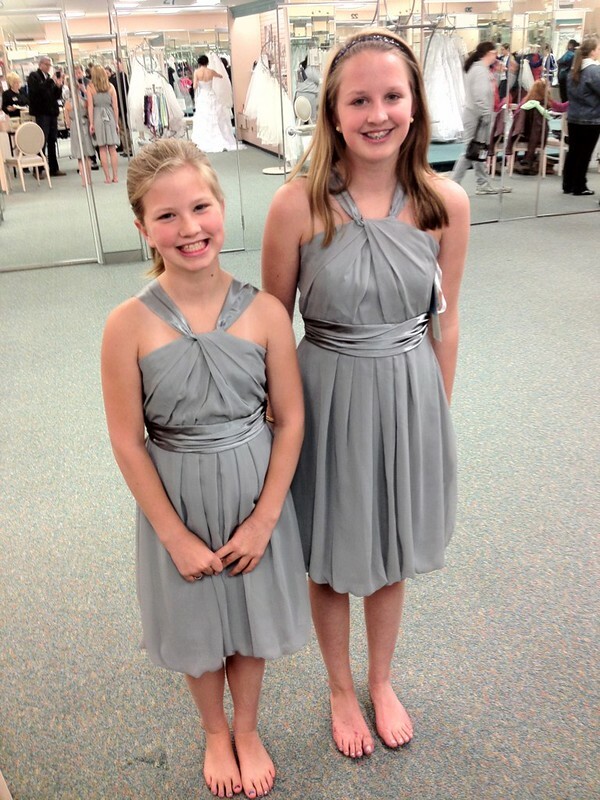 The girls’ dresses are adorable! Love the twist.